When you modify your 335i, the intake temps from the turbochargers skyrocket as they work hard to make more boost. This is bad for performance as heat causes a less dense air charge to your engine. Less dense air = less power, simple as that. Active's "Race" size high performance intercooler works to lower air-charge temps, because cooler dense air is able to make more power, and also helps to lower the detonation threshold. This kit also has rerouted and upgraded intercooler piping, so airflow is smooth in flow and reaches the engine with less turbulence. Shrouding and all hardware is included for a great factory like fit and finish but with much improved performance. Applicable to both N54 and N55 equipped 335i models. Factory intercoolers work well on factory 135 & 335i’s, but with added boost comes added heat load. To overcome this, Active Autowerke’s unit stands tall and way up front, catching more air with the help an 88% larger core and a specially designed shroud. All incoming air is channeled completely through the intercooler by the ram air scoops and no air can escape to the side. There is also an additional undercarriage sump tray to further block any unwanted air entering the engine bay area. 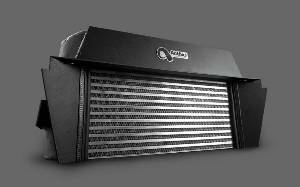 This ensures that all in-coming air stream is routed directly through the intercooler first. The result is the maximum in air cooling that creates the greatest in latent heat transfer. Our tests show an air temp drop of close to 30° F in the intake manifold, with a gain of 12 usable rear wheel HP on a Mustang MD250 dynamometer. Btw: the ambient temperature in our shop measured a scorching 92°F during the session. BMW made a change to the E9x body style from 9/2009 making installation of the Active intercooler slightly different on certain models. The easiest way to differentiate between the "facelift" model years is the style of the grills, headlights and general front appearance. We provide a place to input your BMW VIN# to make sure you get just the right kit.